Welcome to TME’s online catalogue. Choose from the options below for thermometers, temperature sensors and probes. 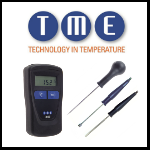 Manufactured in the UK, TME offers thermocouple, thermistor and PT100 types of thermometers, and a wide variety of probes, including immersion, moving and still air, and fixed installation probes, both bench and wall mounted.